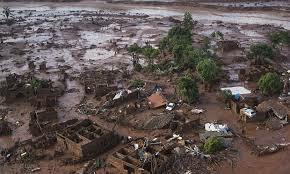 BHP Billiton and its Brazilian multinational partner Vale have been hit with a $44 billion lawsuit over the deadly dam burst last November. Brazilian prosecutors have filed a civil lawsuit for 155 billion reais (just over $44 billion) against the companies. Experts say Brazil’s Rio Doce region will take decades to recover, after the devastating dam burst and mine waste spill that killed at least 17 people in November 2015. Fishermen face an uncertain future, while the potential for further accidents looms. Mining company Samarco and its owners, BHP Billiton and Vale, reached a deal with the Brazilian government to pay an estimated 20 billion reais ($5.1 billion) in damages over 15 years for the deadly spill. The new civil lawsuit challenges this deal, but an even more recent court decision has ratified the deal and may undermine the civil suit. For all our coverage of the Samarco disaster, click here.